The iconic blonde is getting another change of image. Last year, America’s favourite doll, Barbie, was given a makeover, with manufacturer Mattel bringing out more diverse models, featuring three different body types and seven possible skin tones. 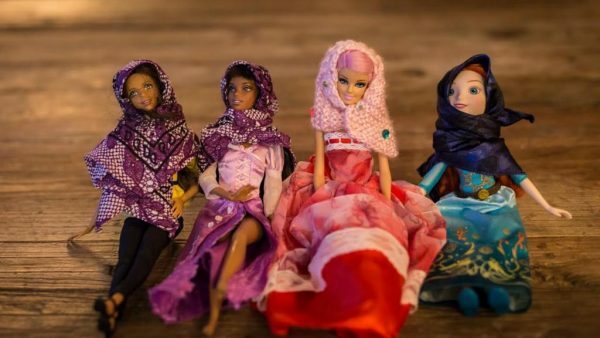 Now two women in Pittsburgh, Pennsylvania, have started making miniature hijabs for Barbies, which they sell out of their non-profit organisation For Good. Kristen Michaels and Gisele Fetterman founded For Good to help facilitate projects that do just what the name suggests: something good for the community. Their first venture is Hello Hijab, a small operation that makes tiny hijabs for Barbie dolls, as a way of teaching children about religious and cultural differences. Fetterman first had the idea after the Women’s March in January earlier this year. Her five-year-old daughter Grace was playing with her dolls and it occurred to Fetterman that none of the dolls were representative of their Muslim friends. So she and Michaels set up Hello Hijab, at first buying the material to make the headscarves out of their own pockets, and employing two seamstresses to make them. The hijabs are sold for six dollars each, and 100% of the proceeds go towards four non-profit organisations: the local branch of the American Civil Liberties Union, the Jewish Family and Children’s Service of Pittsburgh, the Islamic Center of Pittsburgh, and the Change Agency. The bottom line is kids are sponges. Kids learn all the time; play time is really about learning. No matter how you raise your kids, if they see people that look different from them they will question it. We’re not trying to make a political statement, we’re not trying to support or promote a certain religion; we just want our children to know that there are lots of different religions in the world that should be respected and that it’s not a problem to look different. Michaels spoke to FRANCE 24 about the project and why they think it’s important. Neither Michaels nor Fetterman are Muslim themselves, and wanted to run the idea past someone who is. They spoke to a friend, Safaa Bokhari, who is Muslim and wears a hijab. She loved the idea and immediately came on as a partner on the project. We have of course received a negative backlash. People are saying that there shouldn’t be hijabs in America so why are we promoting them? People say that the hijab is a symbol of oppression and we shouldn’t put it on Barbie, an American doll. But at the same time, we now have Muslim children who are able to play with dolls that look like their mothers and grandmothers. Some teachers have said thank you for giving me an inexpensive teaching tool. Hello Hijab was officially launched in April, and the organisation has managed to secure two financial grants to help keep the project going. Michaels and Fetterman have also received donations of hijabs from Muslim women who support the idea and want their old headscarves to be repurposed into a headscarf for a Barbie. For Good is an umbrella organisation with a number of other initiatives in the pipeline to help diverse communities, and the overarching message of Hello Hijab can be summed up in its tagline – “Keep Pittsburgh kind”. Another online project has been styling Barbie with a headscarf: Hijarbie, an Instagram account dedicated to dressing up the doll in stylish hijabs, just as her creator would wear. The account has nearly 80,000 followers and features a diverse range of headscarf styles – including themed posts such as sportswomen wearing hijab. Austrian lawmakers have approved a bill that outlaws wearing a full-face veil in public. The new legislation also establishes mandatory integration courses, and prompts asylum seekers to do unpaid public work. Police will be charging (starting in October) fines from people who wear clothes that obstruct their facial features. The 150-euro fine would also apply to women wearing burqas and niqabs at universities, courts, or in public transport. Other measures in the legislation included setting up a 12-month integration school for migrants who are deemed to have good chances of staying in Austria. The schools would offer German courses, but also teach the asylum seekers about ethics and values considered customary in the country. Other skills, like applying for a job, would also be included. The programs would aim to provide migrants with better prospects in society, said State Secretary Muna Duzdar. “However, it is also clear that people need to take us up on the offers we create,” she was cited by the daily Wiener Zeitung as saying. Migrants who refuse to take part in the courses would see their social welfare benefits cut. Additionally, the law also sees asylum seekers expected to perform unpaid public work, as part of efforts to prepare them for the Austrian job market. The government of Bavaria has agreed to a new law which will ban certain Muslim religious clothing from public spaces. In a late night sitting, the lower house of parliament has approved a raft of security measures and a draft ban on face veils. The ban would only apply to civil servants in Germany. Btru2u • “Swiss are no longer neutral. They have lowered their moral values , to become cheap and nasty violaters of the most basic human rights”…..